Learn to sing with Sweet Adalines and continue learning as long as you wish! Magic City Chorus has a strong educational mission and Sweet Adalines international makes sure that women have opportunities to progress the spirit and sound of womens barbershop wether it be as a chorus or quartet. In a recent interview our director Cheryl Pearce said “Our main focus is education, so it’s like coming to a singing lesson every week”. She also explained how she learned to be a director after she became a member and is continuing to learn through experience, coaching and workshops. Magic City chorus has many reasons to celebrate tonight, as the first night of Region 26 contest is being held in our beautiful city. But one major achievement is for our very own Nancy Kanuka to be acknowledged for her recent completion of her Directors Certification. Online classes, exams, practice, coaching, the process of becoming a certified director takes guts, determination, and a serious dedication. When you talk to Nancy she says she is lucky to have an opportunity to practice her directing by leading vocal warm ups at Magic City practices but I think we all feel lucky. Nancy’s fun loving personality and attention to detail really motivated us to enjoy every moment. Tonight Nancy will have an opportunity to lead the region in the exciting song “Fame” keeping up a good pace and driving tempo will be no problem for Nancy as her engery is endless! Congratulations Nancy! You are an inspiration to us all. In 2015 we got the news that Region 26 would be holding the regional convention in our home town Saskatoon Saskatchewan. What a amazing honor! Not only can we invite our family and friends to watch us compete, the best aspect of a home town advantage. But also the trip to the west coast each year can be exhausting and expensive. Plus we would get to show off our beautiful city to all the Sweet Adelines in Western Canada! The reaction from our chorus members was ELECTRIC! Shortly after we found out the contest would be in Saskatoon, our Captain Norma Wallace called out to chorus members to join the steering committee. I had never attended a contest before but I knew one thing for sure, I knew how hyped the already committee members were and the excitement was contagious so I signed on without a blink! I wanted this contest to be the best contest anyone had ever seen! and well.. the first one I had seen! It didn’t take long until a Drop Box titled “Convention Steering Committee” was created and the first meeting was held on April 15 2015 at Norma’s House. One year before we would host. So many questions, so much potential, so much excitement! I knew it was going to be a rewarding and fun experience working with such a talented and enthusiastic team. All the positions on the team started to fill up and Norma’s kitchen table wasn’t big enough to host such a mighty team. Luckily for us Alice was able to secure us a meeting place at the Radisson Hotel downtown. Working with representatives from all over the region was a real treat. Having Cathy Martin and Yvonne Meyer join us over Skype and Denise Lindenbach commute from Regina SK made me realize what a huge network of super stars I had stumbled into. All these women took dedication and commitment to a whole new level and it was very inspiring. This weekend, after I have my chance to shine on stage, I plan on taking a moment to remember all the hard work and dedication these and many other Sweet Adelines put into making our organization the best organization around. Three Cheers for those who make the sky the limit! Magic City has got what it takes! What does it take? To compete in a regional chorus competition? Each year chorus’ all over the Sweet Adeline’s world prepare for their regional competitions with dreams of making it to the international stage. It’s more than just getting on to a stage and singing a song. It’s about the entire package! Dedication, Team Work, Building Skills, and Practice with Purpose to Perfect your Contest Package! This is a special year for Magic City Chorus as the Regional Contest will be held right here at home in Saskatoon. A large Region like Maple Leaf 26 is spread across BC, Alberta and Saskatchewan and is often hosted as far west as you can get. This year will be great for the fans as they are welcome to take in the quartet, chorus and Show of Champions at the TCU Place in the heart of downtown. We were fortunate enough to preform at the Ensemble fundraiser for Dress for Success this year! The charity helps women with applying for jobs and supplies women with professional clothing to get on their feet. We were so inspired by the name of the charity we built our own “Dress for Success” tradition. Each week leading up to contest we would all dress in the same colour, this will help us look and feel united the weeks leading up to a very special moment in time. The time we take the contest stage. Diane Porsch, from Buffalo, New York, is the Master Director of the Buffalo Gateway Show Chorus. 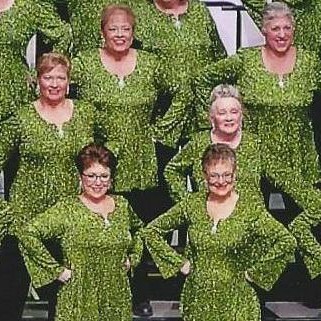 Diane spends most of her time focused on barbershop harmony as a Chorus Director, Coach, and Music Seminar Facilitator. Diane is a Certified International Faculty Member and a Certified International Showmanship Judge. Magic City Chorus is thrilled to have coach extraordinaire Diane Porsch join us for another coaching weekend! Our fabulous director Cheryl Pearce and the awesome Magic City Chorus will be learning, laughing, singing, dancing and loving the barbershop art form and our time together. We are looking forward to Diane’s experience, wisdom, teaching ability and humour. Sweet Adelines International is a highly respected organization of women singers committed to advancing the musical art form of barbershop harmony through education, competition and performance. Valentine’s Day is coming up and we are all thinking about how to best show our loved ones we care on this special day. Chocolates, teddy bears, flowers, they’ve all been done before! I’ve often thought how cool it would be if I could send someone a singing valentine. You know, in the barbershop way, making a huge spectacle for someone special in my life. This year I received a message in my inbox describing this perfect opportunity! I was very interested to learn more about just how special a singing valentine could be! So I talked to Dianne Martin who is part of an all-female barbershop quartet called “Good Company”, who is providing this service to residence in Saskatoon and has been for a few years. She told me they will perform two songs and personalize them to suit the recipient! How cool is that!? “I ask the client to send me fun information about their loved one. In the case of husband or wife how they met or got engaged, what they love about that person, funny little quirks they adore or a special memory. I then write a script using as much of the information as I can fit into the space in the song. Then I read it while my partners hum the verse.” – Dianne Martin of “Good Company”. Next is trying to figure out the best person to receive this singing Valentine, there are so many special people in our lives. Who is the best one to choose? I couldn’t help but ask what kinds of people Dianne had sang for in the past. Ok so, I’m a logistics kind of person, how to get the perfect bang for your buck! I mean it needs to be a surprise, so how do you get it so they are in the right place at the right time? I imagine some planning is involved in carrying out the perfect moment. Now I bet you have started thinking of some special people in your life that you’d LOVE to send a singing valentines to, maybe a spouse? A son or daughter? Parents or grandparents? A favorite teacher or employer? Or your best friend forever? It would for sure brighten their day! Why not book Good Company? They will be offering singing Valentines on Fri February 12th in Saskatoon. Spots in the morning or afternoon are still available! The cost is $50.00 and half of the proceeds are being donated to the Heart and Stroke Foundation! Some highlights of this years show is the addition of 8 new members to the chorus, their gifts are plentiful! Rave reviews from Cheryl’s brilliant collaboration with the Saskatoon Brass. A definite show stopper (or starter!!) was the Austria carol “Schnee-waltzer” that had the crowd and the band (and chorus) moving to the music! Adele and Tracy stole the show with their great sketch about a crotchety grump (Adele) and a over enthusiastic holiday lover (Tracy) and building their friendship during the holiday season. Their hilarious characters had everyone in the crowd giggling and laughing out loud! An overwhelming standing ovation came over the crowd in the second last measure of Hallelujah Christmas, a new fresh version of a magic city classic. This time celebrating the true meaning of Christmas, the birth of Jesus Christ. “And the Heavenly Choir was singing Halleluiah” rung out over the crowd as if the heavenly choir was in the room with us. Our Quartett “One Achord” who preformed a very festive version of Mary’s Boy Child. Our Show Committee Chair people Louise Burton and Marg Brown and all their helpers.